BENEFITS OF KETOSIS - Ketosis is a metabolism state when your body uses ketones for energy instead of cutting carbs. As of results, you can experience improved cognition, sustainable clean energy, and better work-out performance. The process of Ketosis is scientifically proven to achieve the most efficient results! 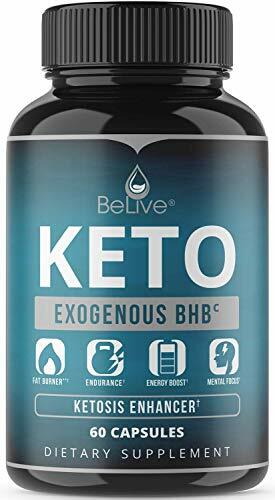 BeLive's KETO BHB is here to help you stay & boost your Ketosis to the next level with our capsules! BENEFITS OF KETO BHB - or referred as Beta-Hydroxybutyrate is a ketone body providing a direct energy source to the brain and muscles. You do not have to be in a ketogenic state to benefit from BHB. Taking external ketones can help your body stay or enter Ketosis. It is a perfect non-carb source of energy! BeLive's advanced KETO pills have 800mg of the purest products that are fast absorbing, boosts your energy to help you power through your workouts, and absolutely max out your potential. SUSTAINABLE ENERGY - Exogenous ketones tablets are able to dramatically increase your energy levels at any time of the day with no jitters. KETO BHB enables you to focus physically and mentally and powering through your toughest workout and daily routines. EASY & CONVENIENT - Simply take 2 capsules per day before a meal. For best results, have a keto-friendly diet, it's one of the most important factors! HIGHEST QUALITY - Made in the USA in an FDA-approved & GMP compliant facility. Our QA team well inspected each pill before bottling. All ingredients come from pure substances. We place our customers above everything else.